Personalized financial planning offers tremendous benefits. Understandably, those benefits haven’t come cheap. But thanks to our friends at SMI Advisory Services and an arrangement they’ve negotiated with MoneyGuidePro®, such planning is now within the reach of more people. Read on to learn how to access the planning software rated number one by financial advisors for the past eight years in a row — at a price nearly anyone can afford. Are you on track to meet your retirement goals? That simple question haunts many American workers. Depending on which survey you read, roughly two-thirds of Americans don’t have a financial plan, which makes it unlikely they’re on a path for a financially secure retirement. Perhaps you’re among those who would struggle to answer the “on track” question, either because you’ve never defined your retirement goals, or you don’t know whether your current financial preparations are sufficient to meet them. If so, we have good news for you: MoneyGuidePro®, considered by many advisors to be the best financial-planning software on the market, is now available to SMI premium members (see Personalized Financial Planning Is Now Within Your Reach for details). This article will introduce you to MoneyGuidePro's® many benefits and teach you how to use it. MoneyGuidePro® can help you eliminate uncertainty, seize control of your retirement preparation, and accomplish your most important financial goals. And we must confess that it is a far superior retirement-planning tool to the worksheets in The SMI Handbook or our old online Retirement Calculator! Developing a personalized financial plan offers multiple benefits. Having a plan relieves anxiety about the future. Most people have little idea how much money they’ll require to meet their needs in retirement. Going through the planning process and seeing everything in black-and-white eliminates the vagueness and uncertainty that haunts many people. It’s always easier to face a challenge when it’s clearly defined. Having a plan helps remove conflicts in marriage. When marriage partners aren’t on the same page in the financial area, it puts huge strains on their marriage. Working through a plan together and agreeing on financial goals (and the sacrifices needed to achieve them), can bring harmony. Having a plan helps you make smarter decisions because you’re not making them blindly or in a vacuum. You can see the impact of one decision on everything else. Spending, saving, when to retire, how and when to take Social Security — all of these decisions play an important role in retirement preparedness. Seeing how each affects the others will help you make better decisions in all these areas. Having a plan helps you stick with your investment strategy because you can see the impact of market events on the probability of your plan’s success. Usually, short-term market events have a much lower impact on a long-term plan than investors realize. Having a plan that continually monitors your probability of long-term success not only will help you set up a smarter investment approach to begin with, it can keep you on track when the market falters and fear rises. For example, seeing that a recent 15% correction has only dropped your plan’s probability of success from 82% to 78% may be enough to keep you from taking counterproductive actions you would otherwise consider. Having a plan can help you be more generous along life’s journey. If you fear you may run out of money someday, as many people do, it’s naturally going to be more difficult to be a generous giver. But when you’ve worked through the details and have a plan that confidently projects a high probability of success, it makes it easier to be generous today. MoneyGuidePro® allows you to set up separate giving “goals” to specifically include your giving as part of your overall financial plan. This offer is available to SMI premium members, so if you’re not yet a premium member, your first step is to sign-up (or upgrade your account) at SoundMindInvesting.com. Go to SMIAdvisory.com. Click on the “SMI Plan” option. Click the “Special Promotions” button in the center of the page (or scroll down to the Special Promotions section). Enter your zip code in the zip-code field. After clicking the button to verify your SMI premium membership, you’ll be taken to a screen to enter your credit-card information. After you’ve been charged the $50 access fee, you’ll be taken to the mymoneyguide.com website. On the MyMoneyGuide site, click the “Register” button, either at the top of the screen or in the lower-left. Enter an email address and password that you’ll use to log-in to the myMoneyGuide® software. Fill in your name and phone number and you’re done! Using this software doesn’t make you a client of SMI Advisory Services, an affiliated, but separate company from the SMI newsletter and website. Naturally if you want to work with them at some point down the road, they’ll be happy to do that. But there’s no obligation or any expectation of that. In fact, at the end of the walkthrough that follows, we’ll explain how non-aggressive they are going to be and how aggressive you’ll need to be if you want to work with them more closely. One final note on your relationship with SMI Advisory Services, should you choose to take advantage of this offer. Because MoneyGuidePro® is designed for advisors to use with their clients, there’s no way to grant access to an individual investor without his or her information being visible to the advisor who licenses MoneyGuidePro®. This means that your data will be in SMI Advisory’s system — there’s no way around that given the way MoneyGuidePro® works. Importantly, this does not mean they are your advisor or that you have any relationship with them other than they are granting you access to this software through their license. Obviously, this isn’t an arrangement we would agree to with any other advisor, but we’re willing to do so in this case because of our absolute trust in and long history working with the SMI Advisory team (SMI Advisory has managed the SMI Funds since their inception in 2005). Once you’re registered, you’ll be asked to select a “Lab,” which is a video-guided walkthrough of the software. There are three Lab types: for those already retired, within 10 years of retirement, or more than 10 years away from retirement. Choose the one that is most appropriate. All three Labs give you full access to the program, but each tailors the presentation a bit more to your circumstances. After you select a Lab type, you’ll be given the option to either “Start Now” or enroll for a future Lab time. Select what works best for you, and don’t worry about having your financial records handy. You can enter estimates the first time through and return for fine-tuning later. Once you accept the terms of service, the Lab will begin. As you go screen-by-screen through the Lab, videos will play that explain each step of the process and guide you as to how to input your information. The videos are immensely helpful and make the entry process easy and non-intimidating. The whole process moves at whatever pace you desire, so there’s no pressure — you don’t even have to finish it all at once. I recommend you listen to the whole video for each section before you fill in any information. I also suggest you maximize the window so it fills your whole monitor — this will give you the most room to work with. The first video explains how to re-size the various parts of the screen. As I worked with the program, I would drag the vertical blue bar to the left initially, to make the video larger while I watched it. When the video finished, I’d drag the bar back to the right to make the input area of the page larger. Here’s a tip to boost your enjoyment of the MoneyGuidePro® process: Don’t worry about entering every financial detail your first time through the Lab. It’s easy to get bogged down in the details, especially when you don’t know the process and wonder if you’ll be able to easily add more information later. You will be able to go back and add/edit details after you complete the Lab. In fact, you’ll almost certainly want to do so. My recommendation is to think of the planning process as moving along in stages. The first time through the Lab, your main goal is to familiarize yourself with the program, see what it’s doing, learn the terminology it’s using, and understand what the process and endgame look like. If you approach it that way, you’ll get to the fun stuff a lot quicker, which is hugely motivating! While the Lab videos provide most of the instructions you’ll need to input your information, it’s helpful to have a roadmap of the various stops along the journey to help you gauge where you are in the process at any given time (see nearby table). Once you see all that MoneyGuidePro® can do for you, we think you’ll be hooked. But if you’re trying to input every single detail up-front, it’s possible to get bogged down. This can lead to fatigue, frustration, and quitting before you reach the finish line. Don’t do that! Instead, take a more laid-back approach your first time through the Lab process. Once you’ve been through it all and see how all the pieces fit, you can go back through some of your entries and fine-tune them. There’s another reason not to sweat every detail immediately: Next month we’re going to explain how to connect to your actual investment accounts through MoneyGuidePro® so that your plan can update in real time! If you have multiple investment accounts and/or detailed holdings, you definitely will save a lot of time if you keep your initial inputs general now and wait for that functionality. Beyond the ease of getting assets entered into the system, that functionality will assist you in making wise decisions following future market declines. You’ll immediately be able to see the impact of recent market events on your long-term plan. Since people tend to overestimate the impact of current events, this aspect of MoneyGuidePro® can help you manage your emotions, which is where most investing mistakes are made. Following are some details pertaining to selected sections of MoneyGuidePro® that can be helpful for SMI members. This section exists to get you thinking about what you want in retirement, as well as how your plan can address common issues. This is also the first place you’ll run into a “How could I know that?” question — how long you think you’ll live. This is a great place to start practicing the rule of not getting bogged down! Use the tools provided to come up with your best guess and move on. As you’ll see later, you’ll have ample opportunity to play with this age input and see the financial impact of dying earlier or later. This is a fun part of the Lab, where you’re encouraged to dream a little. You’ll select goals and drag them into the appropriate groups. Are they Needs, Wants, or Wishes? Then you click on each goal to enter some relevant details. Categorizing them in this way will help later when you work through various trade-offs and options. For example, maybe an annual trip to the Bahamas won’t work, but a less expensive trip to Florida would (or going to the Bahamas every other year). More importantly, these goals will allow you to later distinguish between the must-haves and the nice-to-haves within your plan. For now, go ahead and list them all. The goals section is a great example of how being able to work through the planning process on your own and at your own pace actually can be better than working with an advisor. MoneyGuidePro®’s data shows that when a planner does the entry, they average 2.5 goals per client. But when clients enter their own goals, they input an average of 7.5 goals! Don’t feel like you have to enter every goal now, as you can always come back and add more later. There’s a very simple input screen for this early in the Lab, which is going to be fine for most people at this point (the program presents some great Social Security analysis later in the process). Those who want to enter all of their details can click the Advanced button to do so, but for most, just sticking with the basic inputs is fine for now. Don’t worry if you don’t know what age is optimal to claim benefits — the program will help you figure that out later. Your best guess is fine for now. For now, use the “Summary Totals” option. This will give you the ability to input any employer-sponsored retirement plans, along with contribution and matching information. You can also enter totals and contribution information for any other accounts you have — IRA, Roth, Taxable, etc. After entering those account totals, the program will list a summary of the individual accounts on the next page. If you click on a specific account, a detail screen will open. If you entered the summary totals to start, under the “Holding Summary” heading on this detail screen you’ll see an “Account Total” hyperlink. Click on that link to see how each particular account is invested. Enter the appropriate percentage for each SMI strategy or other allocation category. Take a moment to click on each of your accounts and enter each one’s allocation to the SMI (or other) strategies you currently utilize. The program will project future rates of return based on these inputs, so it’s worth taking a few minutes to enter them now. This page has three sections: a risk score, a portfolio that roughly corresponds to that level of risk, and the loss you would have experienced in that portfolio during the bear market of the Great Recession. At the top, you’re presented with a slider to select a risk score. (These scores can be useful for comparing different portfolio combinations, but aren’t correlated to anything specific outside MoneyGuidePro®.) As you drag the slider from left to right, you’ll be presented with progressively riskier portfolios and shown an average return for each. There are six portfolios presented in the “SMI Newsletter” portfolio set, ranging from conservative to aggressive. A 50/40/10 option is included for reference (this particular version includes a “60/40” split of the Upgrading portion between stocks and bonds.) This may be a helpful benchmark for SMI readers familiar with the 50/40/10 strategy. As you look at the way the various ”Appropriate Portfolio” allocations are divided among SMI strategies, you’ll notice that any DAA allocation is always included in the “Percentage Stock” calculation. Of course, DAA isn’t always 100% stock (in fact, it rarely is). So if DAA is present in a portfolio, understand that the “Percentage Stock” number shown is basically reflecting the maximum stock percentage. At other times, that portfolio will own less stock. The “average return” shown for each portfolio is based on the actual historical (or back-tested) performance of SMI strategies, and weighted according to the percentage allocations shown in the portfolio. Of course, past performance is no guarantee of future returns. To a degree, MoneyGuidePro® is customizable for the advisors that use it. However, certain features are “hard-wired” into the software and cannot be tailored to advisors’ unique situations. So it is with the “Great Recession Loss” section on this page, and this presents a problem with the data MoneyGuidePro® presents to any SMI member using our Dynamic Asset Allocation strategy. As you drag the slider through the various portfolio options, at the bottom of the screen (or to the right, depending on the size of your monitor) you’ll see two red numbers. These attempt to show what the selected portfolio would have lost during the Great Recession. However, these are MoneyGuidePro® calculations based primarily on generic historical rates of return and standard deviation (risk) scores, not the actual returns experienced by the SMI strategies during the 2008-2009 bear market. This is a significant issue when DAA is involved, as the supposed losses shown in MoneyGuidePro® are substantially greater than what DAA’s backtesting indicates would have actually been lost during that specific period. For example, MoneyGuidePro® reports that the 50/40/10 portfolio would have lost -39%, when in reality, this portfolio would have actually lost -16%. So while the “average return” numbers shown on this page for the various portfolios accurately reflect their historical rates of return, the “Great Recession Loss” risk numbers may be overstated. Choose the portfolio that best approximates your risk/reward views for the next few years. Note that you will have the opportunity later in the planning process to adjust the expected rates of return. You will also have the opportunity to choose different portfolio allocations for pre- and post-retirement if you wish. So, it’s okay to use a rough estimate for now and not agonize. 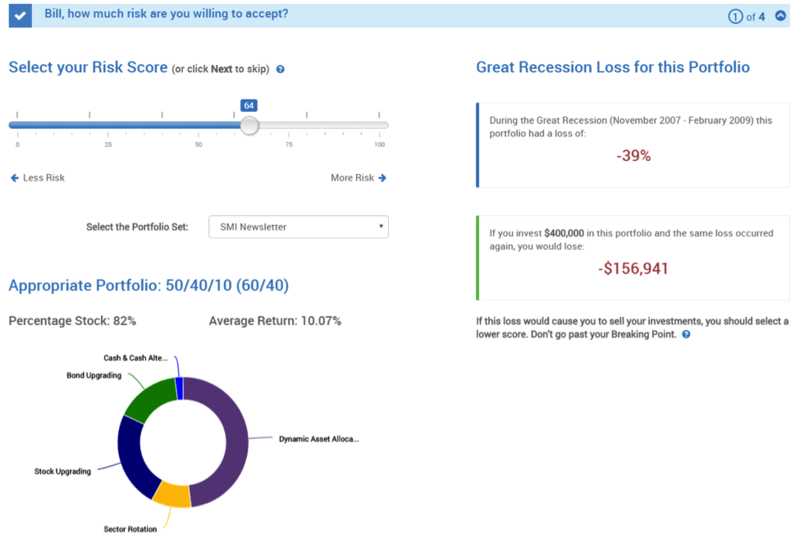 As you wrap up the Risk Score section, you’ll be asked “Will you stick with your investment strategy through a bad market?” The numbers presented there are based on the “Great Recession Loss” calculation discussed above, so disregard those if you have a DAA component in your portfolio. You’ve made it to the fun part! Or at least the interesting part — it may not be “fun” depending on the numbers you’re working with. But this is where the program will run 1,000 trials of your situation to see how likely you are to be able to fund all of your goals without running out of money. If the probability of success doesn’t look great, don’t panic. You’re about to get to work on possible solutions. This is where the real planning work happens, as you begin to work with the variables and trade-offs that will affect your plan. You may notice that the probability of success for your Recommended Scenario is different now from what it was on the prior screen (your Current Scenario). This is because the current scenario uses your present asset allocation, whereas the recommended scenario uses the average returns of the portfolio you just selected on the risk page. You’ll have the opportunity to make adjustments to that in a moment. The Social Security option will run an analysis that can help you optimize the best time to begin receiving your benefits. One of the more interesting aspects of this is realizing that the method that produces the most total dollars isn’t always the method that gives you the highest probability of meeting your goals! This was a surprise to me. The Choices option puts the software to work figuring out reasonable solutions if you’re not on track to meet your goals. It runs through three primary sets of calculations. First, it looks at logical tradeoffs you could make — boosting savings here, cutting spending there, etc. If it has to make cuts, it does so to your “wishes” goals first. Second, MoneyGuidePro® allows you to “Get my wishes” — locking those goals, while looking at other areas to adjust. And third, if you aren’t already retired, there’s an option to “Retire when I want” by locking in the retirement age and making adjustments from there. If you like one of these options, or at least if it gets you moving in the right direction toward your goals, select the button in that column at the top of the page. If not, hit Cancel to go back to the prior screen. The Play Zone is aptly named, as this is where you get to play with your plan and make it your own. 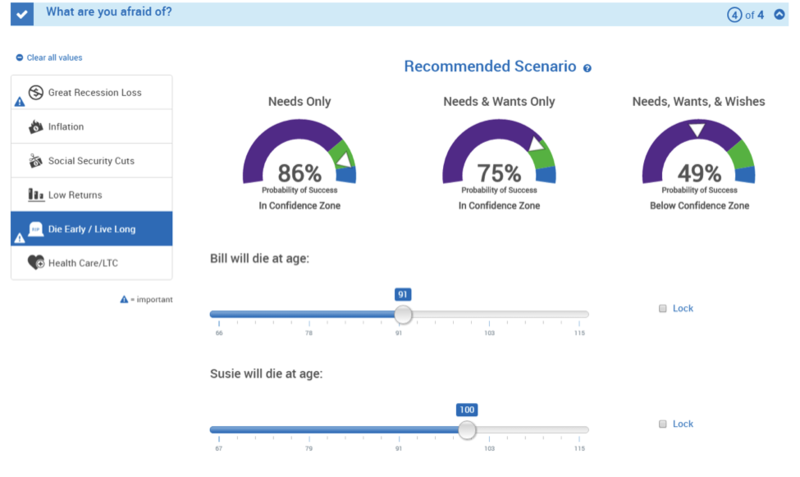 Using the sliders provided, you can try a virtually unlimited combination of options, testing each one to see its impact on the probability of your plan’s success. Want to try saving a little more and/or pushing retirement back a year? You can do that. Or tackle your shortfall from the spending side instead. You can modify the dollar amounts of your needs, wants, and wishes, as well as see the impact of using a different model-portfolio allocation. If you’re fortunate to have a high probability of success for your plan, you can experiment with taking less investment risk, bumping up the amounts you allow for various goals, etc. 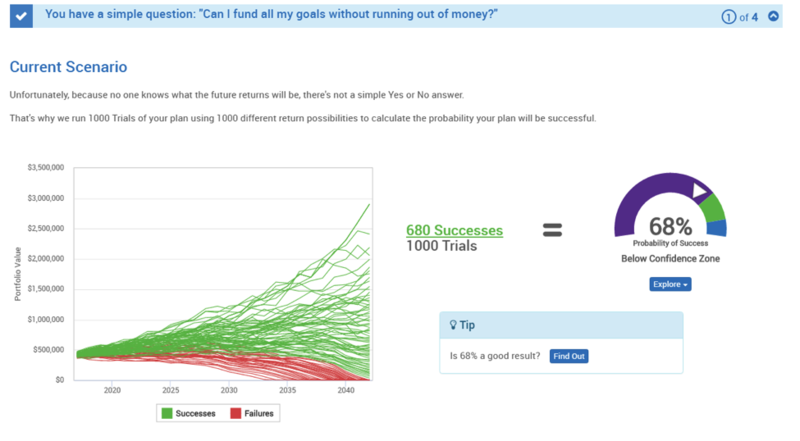 The “Explore” button beneath the “Probability of Success” image at the top of each column is loaded with information about various scenarios and assumptions. When you start honing in on a Recommended Scenario that seems right, you may want to investigate the Explore button data. Eventually, when you get to a combination of adjustments that seems best, you can save your new Play Zone scenario as your new Recommended Scenario — locking it into the system for future use. 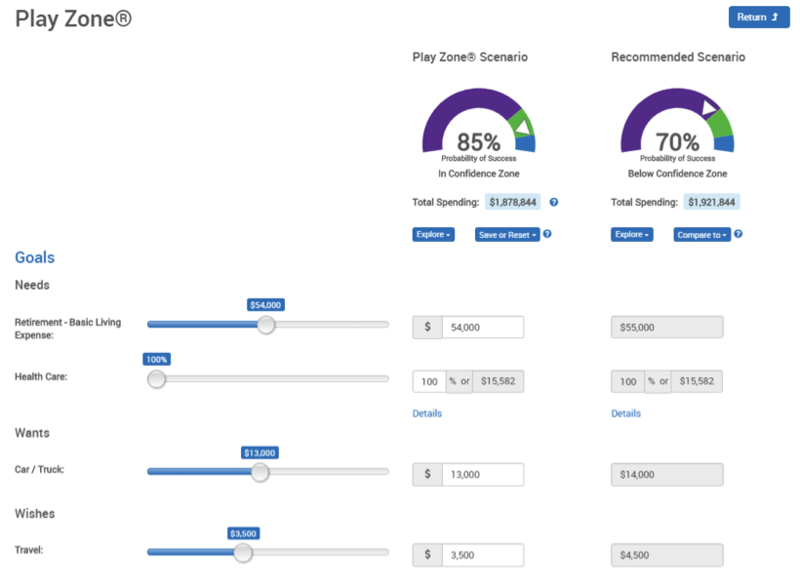 Note that after you’ve made your Play Zone adjustments, you may want to take a second look at your Social Security options on the prior screen — particularly if you adjusted your retirement age in the Play Zone. This powerful section of MoneyGuidePro® takes the new Recommended Scenario you’ve just constructed and stress-tests it using six of the most common “big fears” people have about the future. You can manipulate each of these scenarios and see the impact of that particular variable on your plan’s ability to meet your basic needs, your needs & wants, as well as your full slate of needs, wants, & wishes. This is all easily seen at a glance as you adjust the variables to assess their impact. You even have the ability to combine these variables by locking one while adjusting another. It’s a counterintuitive fact of planning that probing these financial fears is likely to make you less fearful about the future, rather than more fearful. It can be hugely comforting to learn that some of these threats may not pose as stark a threat as you may have imagined. For many people, the anxiety lies in not knowing how big an impact an event would have on their personal situation. Once that impact is quantified, its power is broken. For example, once you quantify the impact of another bear-market loss and the possibility you’ll live to 100 — and your plan still says you’ll be okay — you’re unlikely to panic the next time the stock market drops 20%! On the other hand, if any of these scenarios results in a low probability of your plan succeeding, you can go back to the “Recommended Scenario” page of the Results menu to adjust your Social Security, Choices, and Play Zone entries. This section is another example of a hard-wired page which, unfortunately, couldn’t be altered for SMI readers. It is designed to normally lead a person into a relationship with an advisor, but as we covered earlier, that’s not the goal of SMI Advisory. In fact, even though this page says you’ll be contacted by email and gives you the opportunity to input your phone number, SMI Advisory will not be contacting you at the end of this Lab process (other than to email you a new link in a few weeks that will grant you permanent access to the MoneyGuidePro® software — stay tuned for more on this next month). Even if you answer the question that you would like an advisor from SMI Advisory Services to contact you, they likely will not unless you take the initiative to email them at stewardshipadvisors@smiadvisory.com. Any such emails should not be questions about MoneyGuidePro® (you’ve got Chat for that, remember?) but be limited to inquiring about their Private Client services. It’s important to recognize as you go through the planning process that your object isn’t necessarily to drive the probability of plan success as high as possible. Rather, it’s to make the most of what you have — to accomplish as many of your goals as possible while keeping your plan within the confidence zone. Some are going to find they can’t get their plan into the confidence zone without making some uncomfortable changes. While that’s obviously not ideal, it’s far better to learn that now, while you hopefully have some opportunity to make adjustments to your saving, spending, investing, and working. Use this knowledge as a motivational prod to make changes now for a better future. 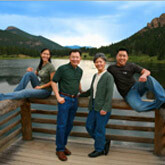 We know there’s a strong appetite for this type of self-directed financial-planning assistance. We’re excited that SMI Advisory Services is willing to make this powerful software available to our premium members at such a low price. We hope you will take advantage of this opportunity and benefit — financially and emotionally — from the tremendous capabilities MoneyGuidePro® offers. "I have a special guardian angel named Sound Mind Investing." "This year has been a rocky road, but I feel that I have a special guardian angel named Sound Mind Investing. Keep up the good work."